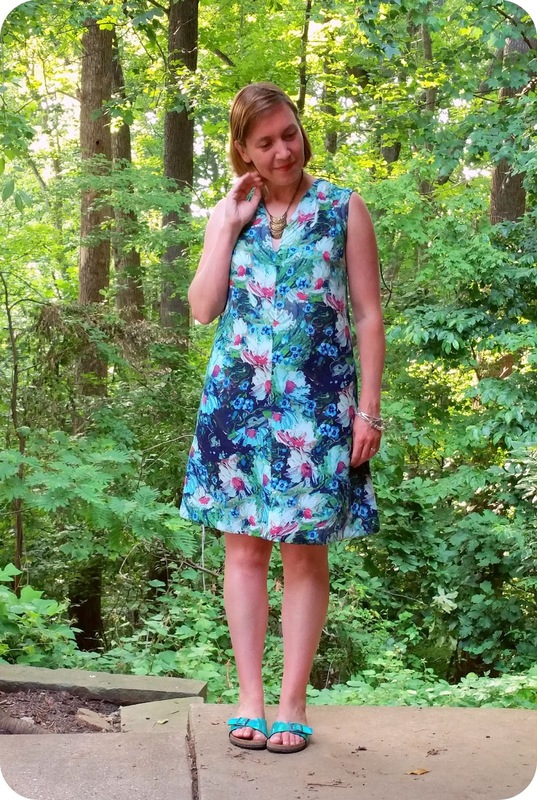 Fabric Mart Fabricistas: Made by a Fabricista: Silk Georgette Simplicity 1059! 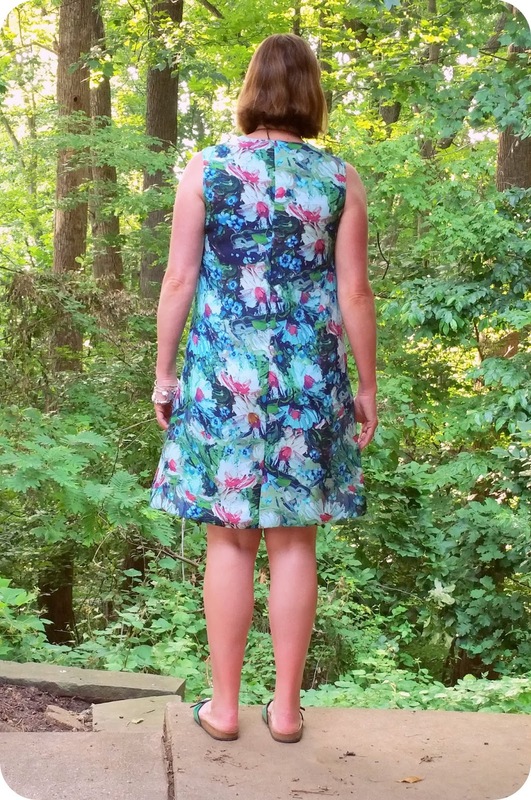 Made by a Fabricista: Silk Georgette Simplicity 1059! 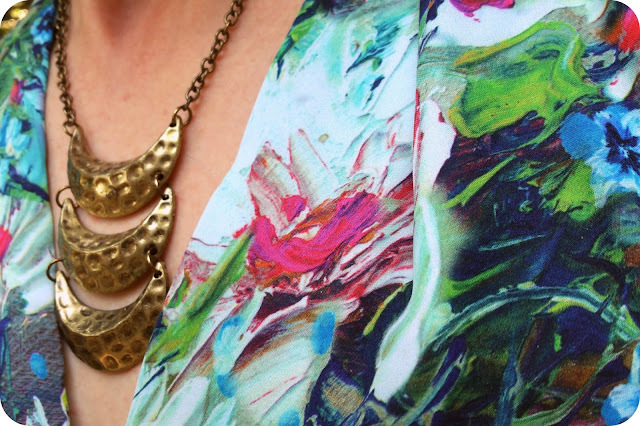 When I realized that Fabric Mart had some gorgeous printed silk double georgettes (my favorite right now!) 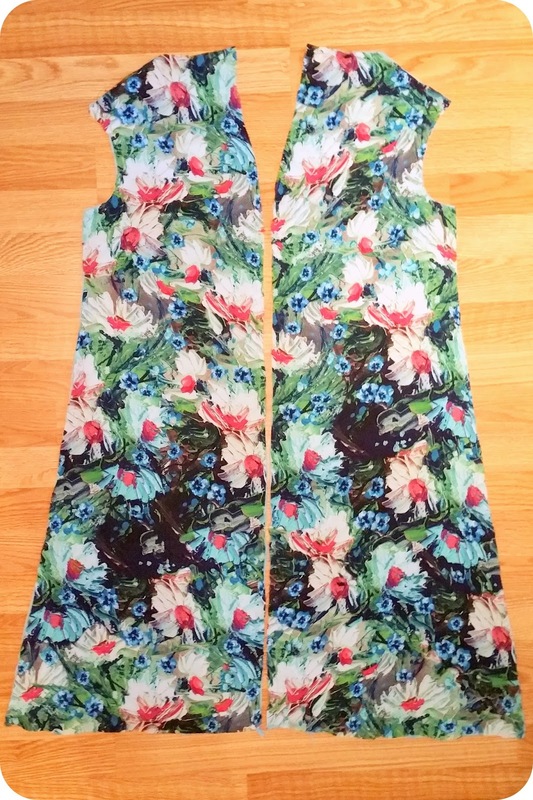 on their website a while back, I knew immediately that I wanted to make something in one of them for a summer sundress. I also realized that since it was sheer, I would need an underlining of some sort, and since they had a lightweight cotton voile in a complementary color available (this is a good choice, too), I made sure to grab some of that, as well, so that the dress could be super lightweight and still opaque enough to wear without a slip (eww, slips in summer, talk about clingy!). I had to settle in on a pattern choice, so I focused on patterns that were sundresses, but also made to be sewn with a lightweight set of fabrics like voiles and georgettes. I saw that I had Simplicity 1059 in my stash, a reprint of a 1969 dress with a center front and back seam, and with a v-neck and a shoulder pleat detail. It listed lightweight fabrics as suitable fabrics, so I knew I would be fine. It also seemed to flow away from the body, so the garment wouldn't cling. Perfect! 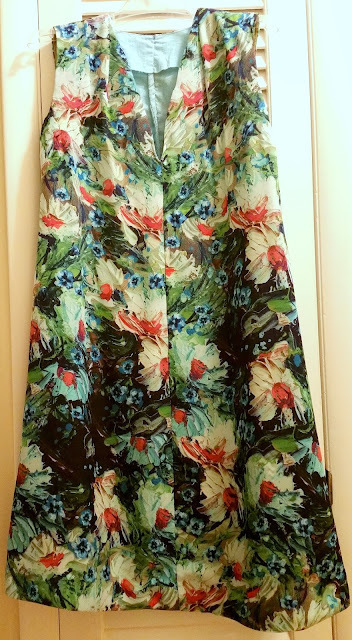 Though the pattern is simple enough, and it is suitable for the fabric choices I had made, once I began the process of creating the garment, I realized I was in for a WHOLE lot of work. Eep! Above you see my silk double georgette, a daisy printed designer fabric that was available for a hot minute and then gone. They still have some available in other prints, and if you love the feel of lightweight fabrics, and are ready to put in some work, definitely pick them up. I am absolutely thrilled with my end result. Worth all the energy expended. The front pieces stayed on grain, but I knew that if I wanted the pieces to stay stable, and I wanted to mark the pleats and other markings, I would need to underline it as soon as possible. As soon as I was done cutting the georgette, I cut the voile using the same pieces (that took far less time, thankfully). 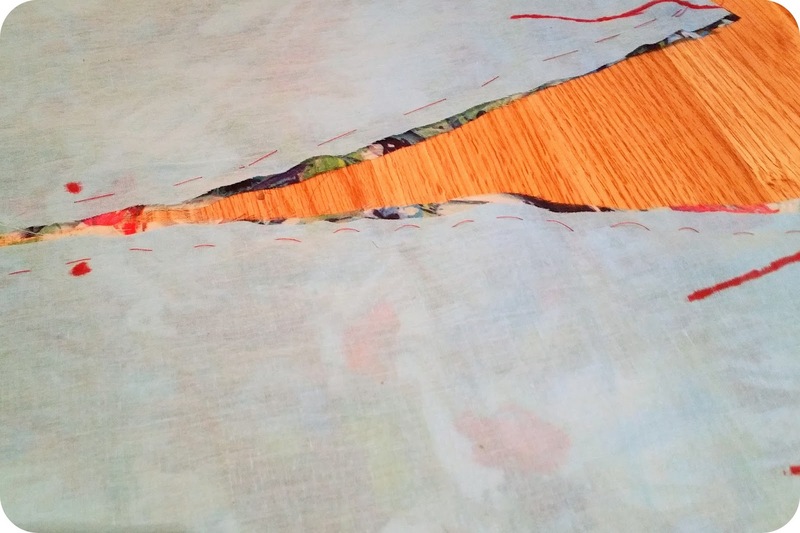 I then placed the silk georgette on top of the voile, and on the floor, I hand sewed the two together using a long running stitch in a bright red thread (I wanted to see the thread after). I then made marks on the voile in a red marker so I could use them when sewing later. I have read that some people use silk georgette on its own without an underlining, as they don't want to lose the super drapey feel, but I can only imagine how difficult it is to control it and mark it on its own. I know it's possible, as I have seen the results, but I felt like my garment is still pretty drapey even with the voile underlining and facings, etc. These markings were super helpful, and made the sewing accurate. The underlining kept the georgette "behaving," and I was able to sew it up by using a straight stitch plate and a straight stitch foot. Nothing caught, and the seams are very secure. The inside shows how much went into making sure that my time and energy were not wasted. I absolutely HAD to make french seams as the georgette was super-ravelly. I seamed wrong sides together a 1/4" and then place the right sides together and seamed a further 3/8". The seams are very nice and I know they will last forever. 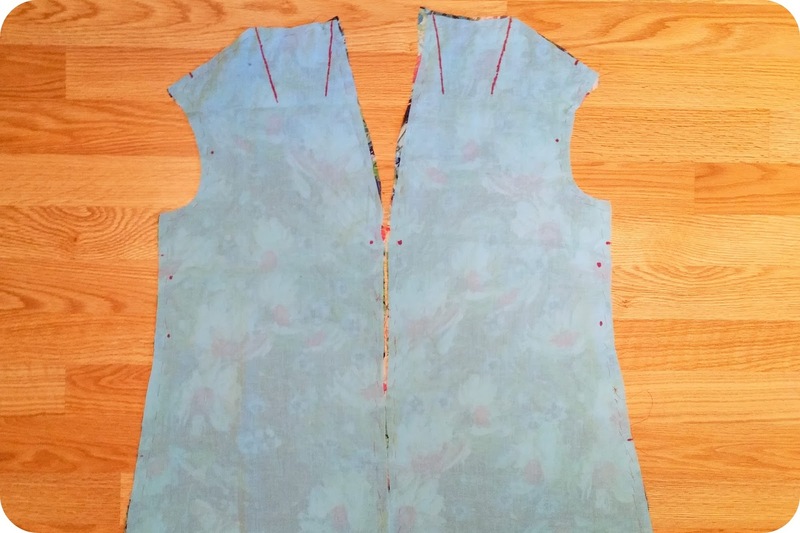 I knew I couldn't french seam the neckline or the armscye, so I stay-stitched those to keep them in good shape, and then carefully applied the facings that came with the pattern (I prefer facings to bias binding, so was happy to see those pattern pieces). I clipped and cut where needed, and after understitching, I pressed the facings to the inside of the garment, and handstitched the facings to the garment where needed to keep them from flipping out. The armscye needed handstitching the whole length on the outside, but the neckline only needed it in a few places. I may eventually handstitch the whole neckline facing, but for now it is fine. The handstitching, btw, is sewn to the underlining, and not the georgette, so its function is invisible from the outside. 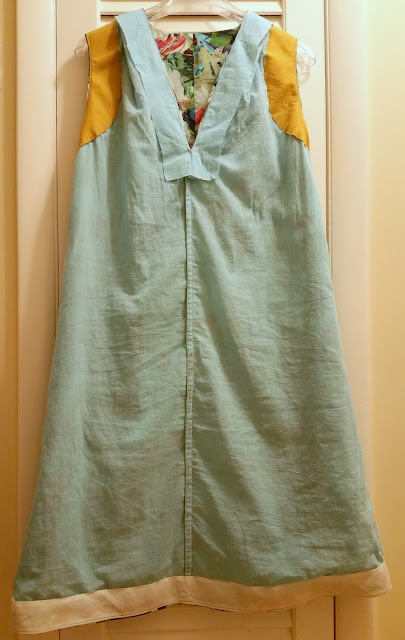 The hem was a bit of a mess once the dress was sewn up, so I chose to hang the garment on my dress form and find a common length and sew a bias hem facing to the line I found. 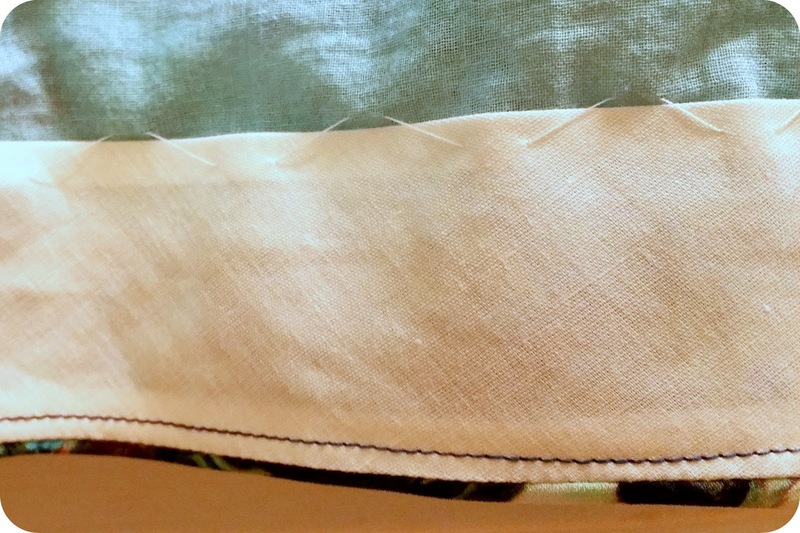 I sewed the hem facing on, serged the excess off from below the sewn line, and then pressed the hem facing up. After that, I hand sewed the facing to the underlining, so that it wouldn't show through on the opposite side (like I had done with the facings). Out of all the things I added to the structure of this dress, this was the one that changed the garment most. It actually helps the hemline stand away from the body a bit, which I personally find pleasing, and which I believe suits the silhouette nicely. If you are not a fan of this, definitely steer away from this hem treatment. Another great hem treatment for this kind of garment is a rolled hem, which I think would keep the "floaty" feel around more. Here's the garment right side out. It looks a bit plain sitting on the hanger, but the subtle shaping and details really shine on the body once worn. I chose to use the size 10 at the shoulder, bust, and waistline, and graded out to a size 12 at the hips/hem. Though I am a size 14 or 16 in my hips, with this more a-line style, I can get away with grading out to a smaller size. The shoulders/armscye were a touch tight on me, but I have square shoulders and neglected to do a square shoulder adjustment (I forgot every once in a while, especially with sleeveless designs, where I need the movement ease less). Next time I will add a 1/4" to my shoulders at the outer bit. The pleating looks odd if you stare at it too long, but since I rarely find that darted patterns work for my small/flat bustline, I prefer this treatment to that one. I think on a solid color, this would be a more appreciated feature. On another note, isn't that fabric sublime? I feel like I am wearing air when I have it on, it is that wispy feeling. The colors are so pretty, too, and the print reminds me of both Van Gogh and some of those 90s babydoll dress prints I used to love when I was a young girl. From the side, belted. The pattern includes a belt design to it, and if I could stomach working with the georgette for a couple more hours, I will make it, but once I was done with the dress and its many hours of work, I decided a store bought belt was more than fine (plus, I have two that match, this pink one and the sage one in the first photo). The belt does hitch the dress up a bit, but the hem allowance is quite generous, so if you are taller, you should still be able to hem it to a place where even if the belt is worn, you won't be adding extra skin exposure to the equation. From the back and unbelted. If you look closely you can see that I did not add a zip here. I chose to leave it out because the dress slipped on just fine over my head and my upper body. If you have a larger upper body, you may want to add the zip. Finally a casual shot! 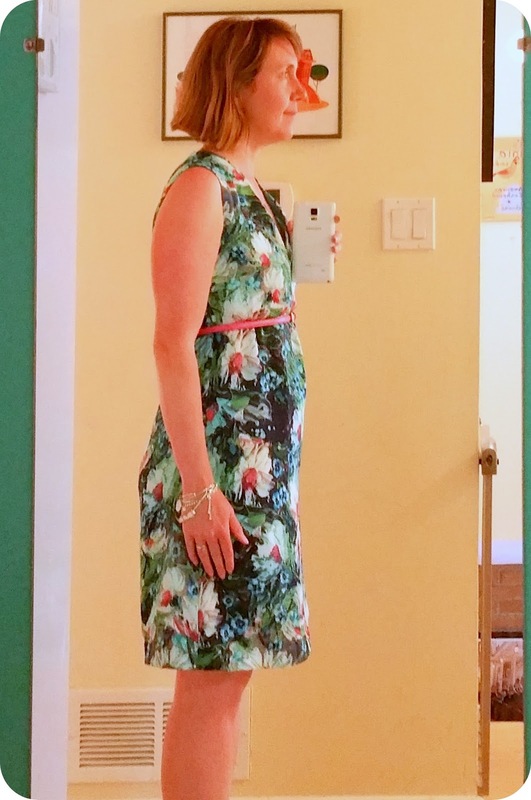 I do plan to wear the dress all dressed up with the belt and heeled sandals, but this way felt so comfortable, I know I will wear it like this too. It is a super sweet look, either way. Very feminine and just retro enough. :-) So glad I was able to give silk georgette a go with this pretty pattern. Let me know if you have worked with this kind of fabric before and what you did with it! I have a few yards of other designs laying around, and would love to be inspired! What a beautiful dress! That fabric is divine. Your extra effort really paid off! So lovely and what a great print! Thank you! I love the print, so romantic and so different than what's out there available now in stores! Beautiful dress! You mentioned your small bust, a problem that I have also. What do you recommend as the best way to alter tops for the small bust? Also, Collette patterns are made for the C-cup, and another company (name I forget) does patterns for the D-cup. Is there anyone who designs patterns for the A-cup? Hi Jeanette, I'm not sure of a particular company that specializes in A-cups, but I would say that you should try to do a small bust adjustment. Directions on how to do that can be found in Palmer/Pletsch Fit for Real People book. It may be a little more work, but may be useful in the long run. I hope this helps! Jeanette! Sorry for the delay! I don't do much to alter. I find that it is not very obvious that I am wearing a bodice that is a bit too big in the bust, especially if I have made it from a printed fabric. That said, I actively search out patterns made for an A cup (or B, if I am really struggling to find something) if I am making something in a solid. The princess cut tops are my favorites, as they seem to exactly work with my bustline the best (which is only barely curved out, I look completely flat-chested in compression fabrics like swimwear, for instance). I wish there were more SBA tutorials out there. There are FABULOUS FBA tutorials, but I think, for the most part, those of us with smaller busts just accept the looseness and wrinkles more (or something). I just get bugged because I *know* the fit can be better and I *shouldn't* have to wear a padded bra to make it work. Some other ideas--I have a few girls patterns that go up to 14 or 16, and those are shorter in torso, smaller in bust, and wee-er in the shoulder line. I do have to do a square shoulder adjustment, but often, right out of the pack, they fit me miles better than the misses ones. I also actively seek out juniors tops and dresses patterns from the era when they still made them. Often an 11 will work best for me as the 33" bust measurement fits my frame well, and its length through the back length is exactly the same as mine at 15.5. I hope that helps! I didn't add the info about the Fit for Real People, since Julie mentioned that above, but they are a good resource, too! It's lovely! Thanks for your detailed notes; all your hard work paid off. Thank you! I forget the hard work by the next time I try something. It's like giving birth or something, you only remember the good parts. LOL. Thanks! I think you should make something. I know you would do such a great job...and it would be super pretty on you, too!!! 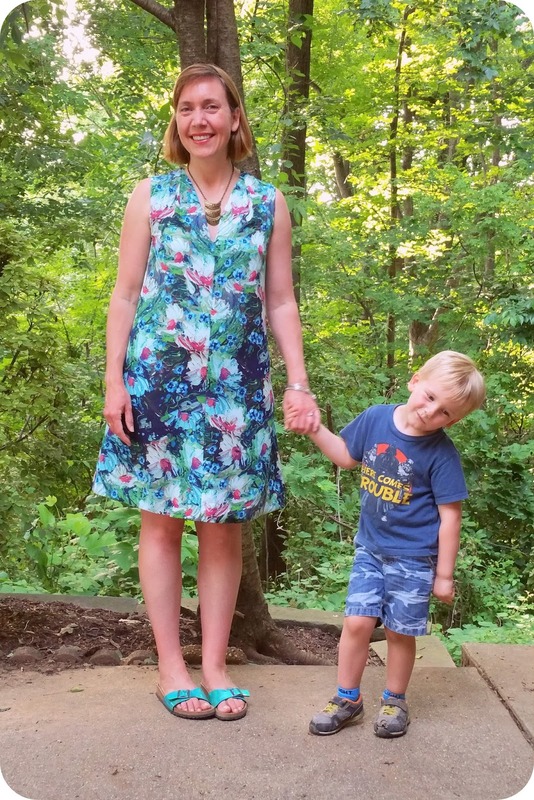 Love the print and the fit of this dress, I have this pattern in my stash! As always a tailor made job well done! Hi, Michelle! I want to see what you would make from this! I know it would be amazing! All the work that you put into your new dress paid off! It is stunning! I like that you made the lining with breathable fabric. I live in hot Texas and avoid silk, georgette and polyester because of the heat. The linings make a huge difference. Beautiful as always!